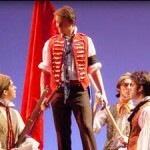 Pittsburgh Musical Theater previews Les Miserable, the timeless story of revolution and love that has touched lives around the world. This production combines the students of PMT's Richard E. Rauh Conservatory with CAPA's 80-piece student orchestra. Prime Stage Theater presents an American Classic: Our Town. Myrna Powell, Director of Three Rivers Youth's The Hub, is accompanied by some past and present clients to share experiences and highlight services for at-risk and runaway youth. The Three Rivers Youth and Hub House has been offering shelter, food and direction for young people since the late 1800s. The cast of Aladdin, now at The Gemini Theater, are LIVE in the SLB studio for a sneak-peek of opening night and this season’s other upcoming productions.